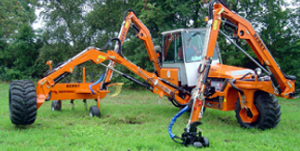 The BERKY range of automotive, self-propelling machines, efficiently mows and clears slopes, ditches and trenches with narrow, half a metre wide lanes. Whether it's the slope mower, the ditch cleaner or the Motrac range ­ all the BERKY machines are high-performance, ruggedly stable and versatile and, in as far as long boom operating ranges are concerned, very high structural stability and safety is consistently ensured. They are furthermore engineered to be user friendly and distinguish themselves for excellent visibility of all the relative tool and operating attachments.